"In 1900 Edmond Rostand wrote a play entitled L'AIGLON, featuring Sarah Bernhardt, based on the life of the Duke of Reichstadt, Napoléon Bonaparte's son. Following his father's death, the young man became a virtual prisoner of Chancellor Metternich at the Hapsburg court in Austria. In 1852, Victor Hugo wrote a poem, 'Napoléon II, in which he called the Duke 'l'aiglon', or eaglet (his father being the Eagle). Rostand described his play as being simply 'the story of a poor child.' This is only partly true. His play was created in March 1900, a time when France was in the midst of the so-called Dreyfus affair and was threatened by the belligerent new German Empire. Jacques Ibert and Arthur Honegger's opera, L'AIGLON was composed two years before World War II. In both cases, France realised it was on the cusp of a world conflict, with a hostile, warmongering Germany. France needed to rearm itself both materially and morally, and artistic creators mobilised themselves. 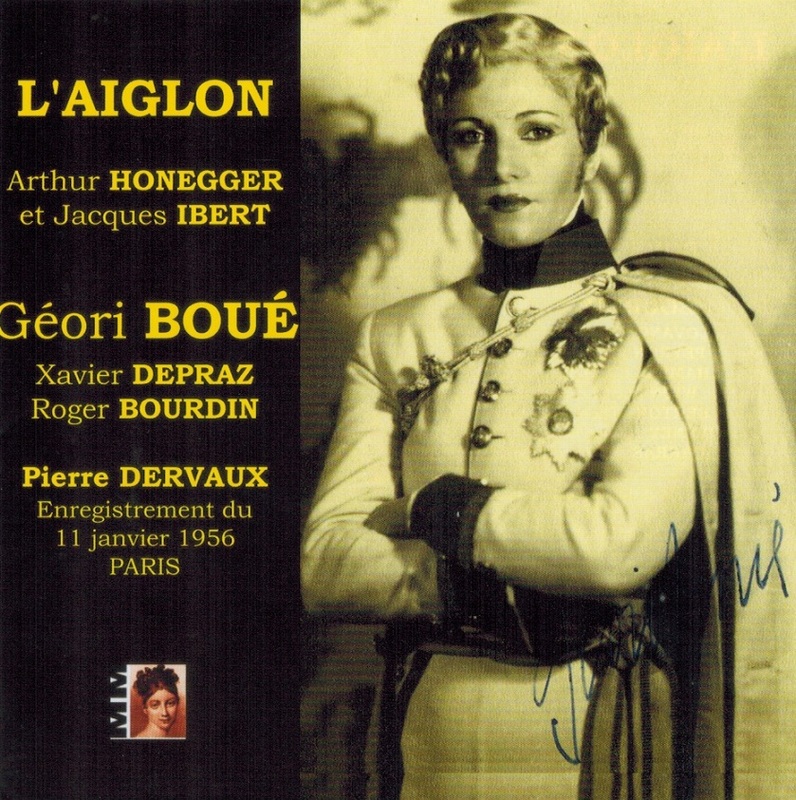 Honegger and Paul Claudel created JEANNE D'ARC AU BUCHER; film director Carl Dreyer produced the PASSION DE JEANNE D'ARC, while fellow director, Abel Gance produced his 1927 masterpiece, NAPOLEON (for which Honegger composed the music). Rostand's play is obviously a personal drama but it is also a reflection on patriotism, honour, manipulation and morality. With L'AIGLON, Honegger and Ibert adroitly use the past as a means to illuminate the future. L'AIGLON is one of the few operas written jointly by two composers. In 1936, the director of the Opéra de Monte-Carlo, Raoul Gunsbourg wanted to present an opera based on Rostand's play. The choice of the composer was a difficult one but two names stood out : Jacques Ibert and Arthur Honegger. The two composers were friends, and they ultimately decided to collaborate on the score. In a 1937 article in FIGARO, Honegger explained the work's challenges and mandate: 'Our work has an undeniable originality; that of bringing together on the same musical collaboration, two composers of the same generation'. The determining factor of this collaboration was a mutual desire to try and create a work with a popular and direct character. In reality, artistic choices were dictated by the composers' respective personalities: Ibert wrote Acts I and V, in which finesse, emotion and restraint predominate while Honegger took on acts II and IV, with their drama and heroism. The third act was composed jointly. The resulting work is intense and moving. The major challenge was to maintain a musical balance while constantly sustaining the dramatic progression so dear to Honegger's heart and also communicating the elegance and subtlety of Ibert's writing. The fourth act in particular contains an epic sweep and great dramatic tension (in a dream, the protagonist, surrounded by an army of ghosts, relives the battle of Wagram). The final act, in which the dying hero is serenaded by a series of popular French songs, is imbued with emotion. This jointly conceived work depicts an Aiglon whose 'clothes are too large for the young man'. And so, just as in the play, a woman interprets the title role. Not only have Honegger and Ibert succeeded in retaining their individual musical personalities, but they have also done so without compromising the homogeneity of the complete work. 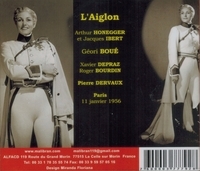 The triumphant premiere of L'AIGLON took place on 10 March, 1937, at l'Opéra de Monte-Carlo with a star-studded cast that included the soprano Fanny Heldy as L'Aiglon, the bass-baritone Vanni-Marcoux as Séraphin Flambeau and the baritone Arthur Endrèze as Metternich." "Geori (Georgette) Boue made her Paris debut at the Opera-Comique in 1939, as Mimi in LA BOHEME (singing in the 1,000th performance at the Salle Favart on 3 May 1951), and other roles there included: Lakme, Manon (singing in the 2,000th performance on 18 January 1952), and Ciboulette (first performance at the Opera-Comique). In her HERODIADE, Louise, Gilda, Violetta, Desdemona, Tosca, Madama Butterfly, Tatiana, etc. Boue had a clear voice of considerable power, renowned for her impeccable diction, she was widely regarded as one of the greatest French sopranos of the 1940s. 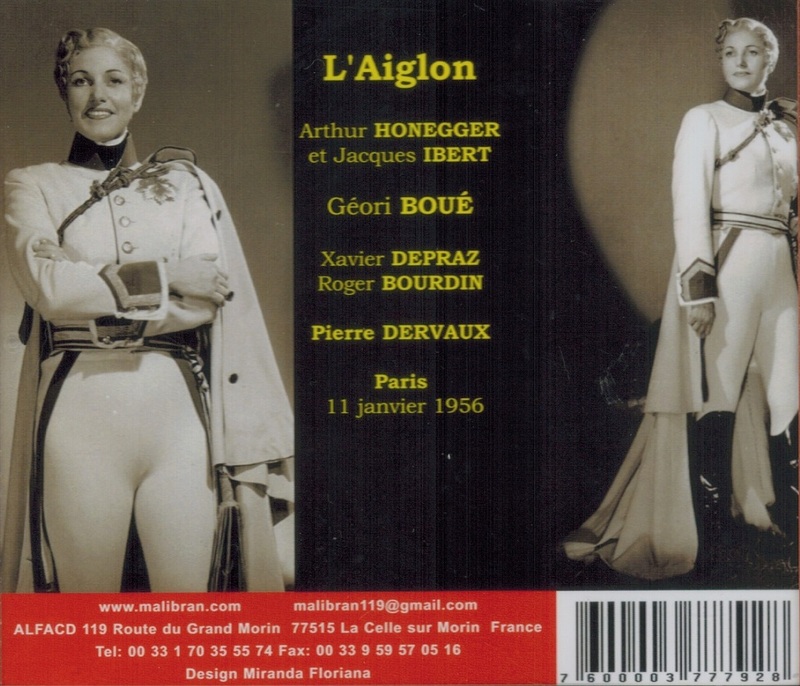 She was married to French baritone Roger Bourdin in May 1944, with whom she can be heard in two recordings, FAUST under Thomas Beecham, and THAIS. She retired from the stage in 1970, then died 5 January, 2017, at age 98."